Why do we play golf? This question was recently asked to me and although I had a quick and direct answer, I found the more I thought of it, the more complex the answer really is. My off the top of my head answer was that golf is fun, interesting, challenging, and fills my desire for competition both against others and myself. Have you ever asked yourself this question? Is your reason social, business, exercise, outdoor activity, wanting to do something with a spouse, competition, gambling, just something to do, or something else? Everyone had a reason for starting to play golf, but after that, what makes you continue? Your “why” has a lot to do with your attitude and pleasure that you derive from your round of golf. If you answered, “To have fun and be with friends”, then why did you get angry and routinely feel frustrated at the completion of the round? It has been said that you can learn more about a person’s true character by spending four hours with them on the golf course then years on a psychiatrist’s couch. Golf is a game, but during our time playing the “game” we experience joys, disappointments, challenges, bad luck, fortunate breaks, and outright robbery. It is how we handle the adversity that defines what type of person we are. 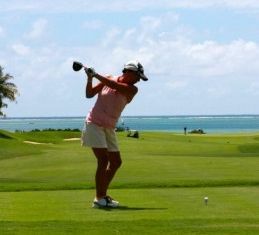 Jerilyn Britz, the 1979 U.S. Women’s Open Champion once remarked that, “Golf is actually pretty easy, it’s just hard to do!” The average PGA Tour professionals only hit 66% of greens in regulation and only 61% of fairways with their drives. So why the disappointment when you miss the green with a seven iron? The “why” is because you have hit that perfect shot before and unrealistically expect to do it again and do it every time. That type of person is bound to not be happy and continuously striving towards an unrealistic goal. Why do you play? Do you want to be a tour pro? If so you have to dedicate almost all your time receiving the best instruction and then spending long hours on the range honing your swing. After that you have to learn to compete. It is a big commitment. Do you play for fun? Then smile after a good shot and smile after a bad shot. I bet you will play better. Do you want to play better? Take lessons and practice with an open mind and experience the new technique. Feel the mechanics and see the results of the ball flight. When you play on the course, revel in the good shot that you experienced on the range. Don’t be upset with the poor shots that are part of the learning process. Are you there for the exercise, the social aspects, or being out in nature? Then remember your reasons for being on the golf course in the first place. Golf will be a lot more enjoyable when you don’t have to constantly strive for precision on each shot. Touring professionals also have different “why’s”. For Tiger Woods, golf is all encompassing and consumes his world. Golf is his vehicle to compete and be the best. Jordan Spieth has an equal desire to be the best, but is more balanced in his life. Rory McIlroy started off as if golf was the only thing. Now he is taking time off and enjoying his rewards. Many tour professionals play only to make a living. Those are the grinders and grumpy ones that you see at each event. I am sorry for them. I enjoy seeing the Phil Michelson’s of the world play. You can see their enjoyment and fun in their games. They aren’t counting every shot as lost revenue. Bruce Lietzke, a very good player from the 70’s, 80’s and early 90’s, would play until he got enough money for the year and then would quit so he could spend the summers with his wife and kids. During his time away from the Tour, he never picked up a club. I respect that. Golf was important, but family came first. Bubba Watson just made a statement that he would quit if he ever reached the #1 ranking in the world. This statement shows that Bubba wants to quit on top and that he is not afraid of life after golf. I don’t think he can be the number one player (he is presently 4th), because Spieth, McIlroy and Day are much better players and more consistent. However, if he walked away today, you would have to say he had a very successful golf career. We all have different “why’s”. I think it is important to understand or at least look at your reasons for playing golf. If you are pressing or have hit a wall, take a step back and analyze. What are you trying to accomplish? I think we all want a degree of accomplishment and happiness in our life. What are the steps to make that happen? The first step is taking golf back to being a “game”. If it’s a “game”, then it can be enjoyed. And if enjoyed, your attitude and mental outlook will open up and (surprise) your golf game will become easy again.